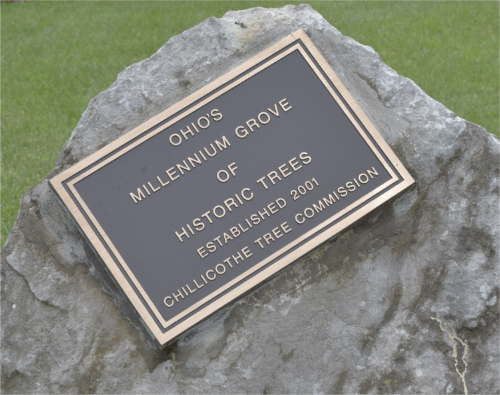 The Millennium Grove is a stand of over 100 trees with historical ancestry located in Chillicothe, Ohio. Each tree has significant historical ancestry. Every tree is a direct descendant of a tree that is, in some way, related to an event, place or person. Learn about the History of Ohio's Millennium Grove. Each tree has an "ID" consisting of the one-, two- or three-letter group abbreviation and a number. So, OH-1 is the first tree in the Ohio History section, for example. The trees in each group are generally ordered from oldest to most recent with regard to the event, place or person to which they are related. There are a few deviations from this pattern, but most of the grove adheres to the scheme. Two placards are mounted on a post next to each tree. One of them simply has the ID and the other has the ID along with additional information about the corresponding person, place or event. The placards are affixed in such a way that you can see the next number in the group from the current tree. We suggest using the ID as a basis for a self-guided tour. If you go to a tree's listing on this site, you can find some information and at the bottom of the page, a link to the next or previous tree in the grove. Note: Due to the difficulties of growing trees from across the country in south-central Ohio, it is inevitable that some of the trees die. If a tree dies, its historical significance may justify replacement. In some cases, however, the original ancestor is not available. In this case, the tree will be marked as, "A Representative Tree".